The new Hercules WAE-BTP02 (Wireless Audio Experience) Portable Bluetooth Speaker has been created for all those who have turned their iPhone (or Smartphone) into their new music system. No more wires, thanks to the speaker's built-in Bluetooth capability. You can stream any music from your iPhone or from other Bluetooth devices (Smartphone, Tablet or computer) to the speaker. Its unique design is both modern and ergonomic. A handle lets you easily carry the speaker from one room to another. The WAE-BTP02 offers record-breaking battery life: enjoy up to 20 hours of non-stop music at medium volume (based on 73dB SPL @ 1m). The best in class Bluetooth technology insures both incredible sound quality and convenient range within your home. Just turn on Bluetooth on your smartphone and connect with the speaker, and you're ready to enjoy your music. Install the WAE app and control your speaker at your fingertips. Turn the volume up or down on your speaker from your smartphone, enable audio effects and pre-defined equalization. Enjoy a huge database of web radios and a funky player to listen to your favorite iTunes playlist. Thanks to the device selection icon you decide where the sound needs to go, either on your smartphone or to the WAE speaker. The speaker's sound quality benefits from Hercules' extensive audio expertise. The challenge met by Hercules' R&D team was to create a speaker that could deliver powerful sound, while consuming as little electricity as possible, in order to optimize battery life. Amplification was therefore the key point in developing this solution, which goes above and beyond what had been thought possible: the Hercules WAE portable speaker BTP02 delivers up to 25 W peak power output, and consumes only 60 mW at 73 dB SPL. 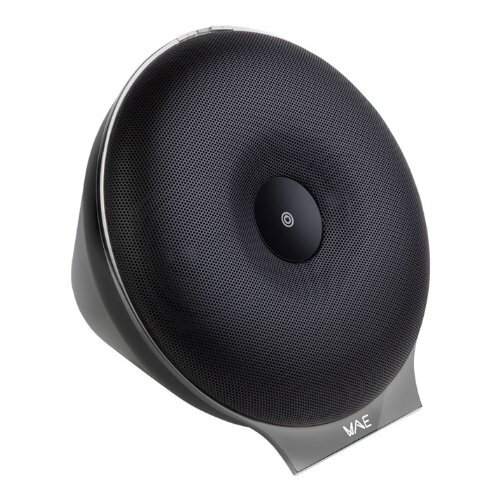 At this volume, the speaker can provide 20 hours of non-stop music playback! Bluetooth 3.0 AD2P , Pure and clear stereo sound, up to 25 W peak power , Stereo Wide and Bass Boost effects , A vent and 2 isolated chambers provide 1 liter of air, ensuring enhanced bass response. The application includes the following features: 1.) Control your speaker (volume, audio effects, off); 2.) Listen to your music and Web radios provided for free within the app; and 3.) Play with the equalizer to tune your music.